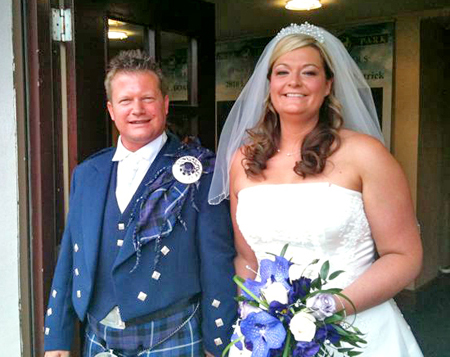 Steven Cicero and Carolanne Mitchell were married in Scotland on August 6, 2011 at Deer Park Country Club in Livingston, where they both live and work. Steven has his own painting and decorating business there and Carolanne is a veterinary nurse. Steven is the son of Shelter Islander Louie Cicero, and he and his brothers, Mike and Dave Cicero, all formerly resided on Shelter Island. The wedding was celebrated by the groom’s mother, Myrna Ferries, and stepfather William Ferries, and the bride’s parents, Anne and William Mitchell, all from West Lothian in Scotland. Alastair Angus of Midcalder, Scotland stood up for the couple as best man. The ushers were the groom’s brothers, Mike and Dave Cicero; the groom’s nephew, Marc Cicero; and the bride’s brother, Andrew Mitchell. As well as friends and family from both sides, the wedding was attended by Shelter Islanders Tom Cronin and Jack Gibbs, who flew over especially for the event (as well as for the Scottish beer and the golf, Steven’s brother Mike said). Many more friends joined the couple at Deer Park Country Club for the evening reception, and a good time was had by all — although Islanders Tom and Jack found it difficult to understand the Scottish accents and could not be persuaded to wear traditional kilts for the wedding. Mike reported they did do the Island proud, however, by doing a Scottish jig or two on the dance floor. Shelter Island was present at the reception in a number of ways. The names on the wedding guests’ tables had the names of places on Shelter Island — the Heights, the Dory, the Chequit, the Pridwin, Sunset Beach, Wades Beach and Dering Harbor — “We took great delight in telling the guests they were places where we grew up and remember with great fondness,” Mike said.